He has never known his father, and his mother finds life difficult. For reasons he can’t fathom, his big sister, Abigail, seems to hate him…David Kidman is a boy eager to please and desperate to be loved. He knows he doesn’t fit in but he doesn’t know why. He can’t read or write, so can’t adequately express his feelings. Everything he gets involved in seems to turn bad… Ironically, it is only when he reaches the end of a lengthy prison sentence that he is able to make any real sense of the disturbing world inside his head and discover truths long buried; truths that are revealed through his bourgeoning literacy and a whole series of his ‘imaginings’. ‘…but as for ‘Perspective’ we just couldn’t see it at first. He gave us a pencil, ruler and a sheet of A4 paper whilst he demonstrated the basics of the Vanishing Point. I liked the sound of it. As he spoke it began to make sense. ‘I felt good, and big, and loved, and important; and I looked up, through the windscreen, to As Far As The Eye Could See. I had done this before with my dad. David Kidman becomes Emotionally Literate. We just hope it will see him through the rest of his life. 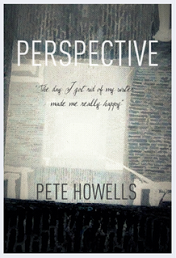 Patrick represented Pete Howells through the Christopher Little Agency. In July 2008, Patrick added to his prestigious career by launching the Blue Door Imprint for Harper Collins. Book Launch – 18th Sept 2011, 5-6.30 pm @ The Old Market Arts Centre, 11a Upper Market Street, Hove, BN3 1AS. To include short readings plus Questions & Answers by the Author.